Step into a world of organic beauty and escapism. Nature: captured, abstracted and reinterpreted by two deeply thoughtful artists: Juliane Shibata and Michael Kessler. Experience the fluidity of form, delicacy of structure and transitional textures that bring the impermanent natural world to permanent life in the spaces that surround us. Feel calm, grounded and reflective in the presence of these stunning works of art. Shibata creates botanical installations that reflect on the relationships between humans and the natural world. Flowers and plants have a defined lifespan; they grow, bloom, fade, and decompose. She is interested in the contrast between the transience of nature and beauty and the stability and permanence of fired ceramics. Also compelling to her are the boundaries between abstraction and botanical specificity; complexity and simplicity; two and three-dimensional; happenstance and control; and light and dark. Juliane finds the space between realms to be especially poignant, indecipherable, and difficult to convey; the median strip between two clear paths is often the most contemplative and open-ended, both visually and conceptually. The color, finish, design, and placement of individual ceramic pieces are essential in her ability to evoke quiet and introspective narratives. As she positions some sculptural pieces post-firing, she takes a more open-ended and intuitive approach when installing the components. The story behind Shibata’s work is allowed to evolve until she decides on the particular conversation the pieces share with each other. 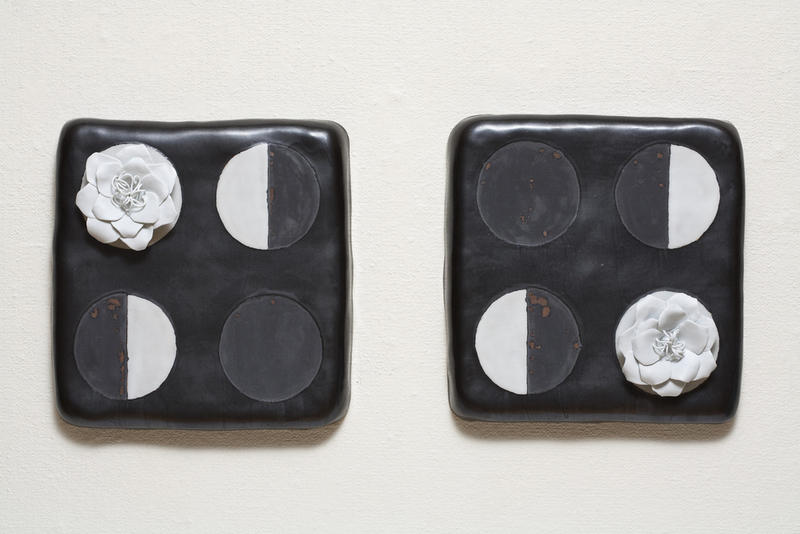 Her sculptures and installations involve the repetition of individual ceramic components. Some works are quite large and are composed of hundreds of small porcelain elements, while others hang on the wall and are more contained. Although it takes time to create a large number of thrown or handmade items out of clay, she is attracted to the rhythm that is generated when they repeat and begin to energize the space around them. The ceramic fruits (i.e. pears or persimmons) used in her sculptures are thrown and altered; Shibata finds that throwing lends each form a more distinct individualistic quality as opposed to those that are slipcast. All porcelain pieces are fired in a reduction atmosphere to 2345 degrees Fahrenheit in a local kiln that she loads and fires with a group of Northfield potters. When appropriate, Shibata completes the firing cycle by applying gold luster to accentuate various aspects of the work. Juliane received her MFA in Ceramics from Bowling Green State University in 2006, having previously graduated from Carleton College with a BA in Studio Art. She has been an artist in residence at Ox-Bow, the Appalachian Center for Craft in Tennessee, and The Pottery Workshop in Jingdezhen, China. Juliane has taught at Hope College in Holland, Michigan and at Carleton College in Northfield, Minnesota. One of her pieces belongs to the permanent collection of Northern Arizona University’s Art Museum. Born in mining country in Hanover, PA, and resident since 1996 in the fossil-laden vicinity of Santa Fe, NM, Michael Kessler comes by his sense of landscape and geology honestly. He has said he was influenced in his youth by the stark visions of painter Andrew Wyeth. The severely graceful lines and notable elegance of his compositions make that influence easy to believe, but if Kessler’s paintings are in some sense landscapes, it is interesting to note how that form breaks apart and widens its associative range when wed to the sort of pure material abstraction that Kessler practices. His landscape is no longer about the body or concerned with the proportion of daily life and movement to the sweep of the surrounding world. Although day and night and a quality of personal encounter are very much present, dimensions have shifted and the paintings glimpse the layout of the mind. They intuit ways in which knowledge penetrates hidden structures, alternately folding in upon itself and melting through to ever more mysterious terrain. Kessler achieves his effects by pouring and rubbing many washes and skims of acrylic paint over panels. Influenced by Richard Tuttle, with whom he has collaborated, he emphasizes the importance of gesture and the harmonious implications of a painter’s movement: it is important to know where and how to begin. The logic of his approach, which gives equal weight to physical laws and singular events, suggests a dialectic that is at once strangely moving and visually compelling. Michael Kessler won several prestigious awards and fellowships (American Academy in Rome, Pollock/Krasner, Whitney). His work is in the collections of 24 museums nationwide, including the Santa Barbara Museum of Art, and can also be found in a seemingly endless number of corporate and private collections. One of his pieces is at the Weisman Art Museum in Minneapolis in their permanent collection. He received a B.F.A. degree from Kutztown University. 6 x 6 x 2.5"
29 x 50 x 2"
17 x 17 x 4.5"